Produce at the Volcano Farmers Market. 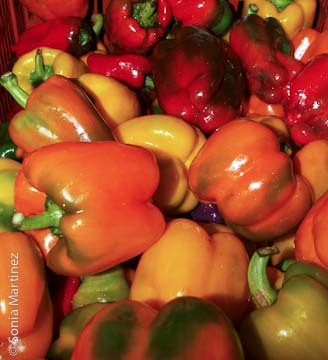 The Volcano Farmers Market is one of the longest running markets on the island. Located at the Cooper Center in the Village of Volcano for the last 25 years, it is also a place you better make sure to drop by early or all the "good stuff" will be gone by the time the sun is properly up! As one market vendor commented; "the Volcano Market is a wonderful community party every Sunday morning!" I was greeted by a stunning variety of breakfast choices, from Thai chicken soup to fluffy whole grain pancakes, homemade bagels and freshly made cheese, fresh baked goods, carrot/beet/ginger juice made to order, and more!" The selection of produce is also a bit different from markets not too far away. I found gorgeous Ka'u grown cauliflowers, potatoes and onions; beautiful mangoes; wonderful fresh baked breads and pastries and delicious toffees. I was able to meet Marla Hunter with whom I had corresponded via e-mails in the past. She and her husband Pete have owned and operated Eke Nui Nursery in Na'alehu for the last 12 years and have been participating in this market during season for 8 years. 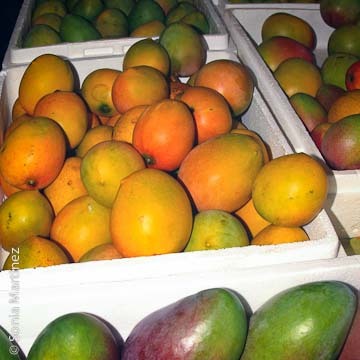 Their main crop is mangoes, and they must have had at least a dozen fragrant varieties, among them Mapuleha, Golden Glow, Manzanillo and Gouveia displayed on their table. They also grow some citrus and avocadoes and a few other things at their 600 foot elevation farm in loam and Pahala ash. Although they are not certified organic, they use no pesticides and mostly organic fertilizers. As Pete said, "we eat them too." Marla and Pete were new to farming until they moved to Hawai'i, although Marla kept a greenhouse for personal enjoyment in California and has enjoyed plants for many years. When asked how they got started, she said that she started planting a few seeds from mangoes eaten, then Pete did a bit of grafting and the rest is history! They feel that the energy at this market is very high and they love participating in it. "It feels healthy every time we go there", Marla says. 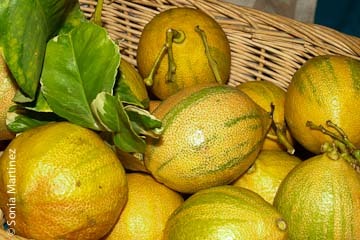 Eureka lemons from La'iku Organic Farm. I have known Deborah Ward of the La'iku (Peaceful) Organic Farm and Special Ti Nursery for several years and was happily surprised to see her there. Debbie has been participating in this market for about 3 years. The farm, which she owns with Fred Stone, is located in Kurtistown and has been in operation for 7 years and run in accordance with the USDA National Organic Program rules, but because the farm income generated is less than a certain level, they are exempted from certification requirements. Exotic tropical fruits and spices such as ice cream beans, chico, sapote, curry leaves, nutmeg and mace, jaboticaba, liliko'i and tree tomatoes among others can be found growing on their farm at any time, as well as a variety of citrus, rambutan, soursop, lychee, breadfruit, chayote, kumquats, pineapples, rollinia, mountain apple and about 12 different varieties of bananas. When asked how they got started, Debbie replied "This may sound strange, but I was diagnosed with a serious cancer the year we bought the land, and when I planted the trees, I thought the orchard would be a tangible gift to my children when I was gone. Now the trees sustain us in the most fulfilling and spiritual sense—they are our pride and joy, and our nourishment as well! We feel as though we live in the Garden of Eden, and every day of farming adds a year of mental health!" Debbie and Fred donate surplus from their farm to the Volcano Friends Feeding Friends and to the Food Basket in Hilo. At the Honomu Jams & Jelly table presided over by Courtney Carroll, a very pleasant young lady who mans the booth for Akaka Falls Farms I found a large variety of products, all made from fruits grown on the farm located just above the Village of Honomu. As their website explains, "It begins just down stream from the majestic and magical Akaka Falls"
Akaka Falls Farms' owner Steve Stefanko says his organic farm grows a large variety of fruit on previous sugar cane fields and depending on seasons can have anywhere from 75 to 100 different fruits with which they make jams and jellies. At most times you can find a selection of at least 30 to 40 different products. The colorful labels depict the ingredients; Tahitian Lime Ginger Jelly, Fig Jam, Olelo Berry Jam and Poha Berry Jam are just a few of the jars I had to bring home to try. To give the true flavor of each fruit, no water or fructose corn syrup is used. The sweetener of choice, if any is needed, is Maui Brand™ raw sugar. 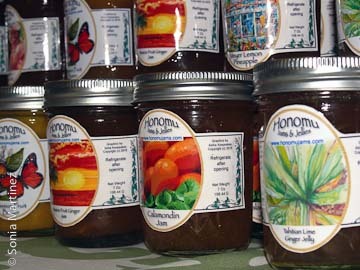 "We believe at Honomu Jams & Jellies in taking care of our beautiful 'Aina (Land). This is why we choose to be an organic farm. All the fruits used in our preserves are from our farm, which allows us to produce all of our delicious and healthy jams"
Counterclockwise from the top left of flower, Swirl Toffee, Keaau Coffee Toffee, Macadamia Nut Toffee, and Lilikoi Coconut on white chocolate. 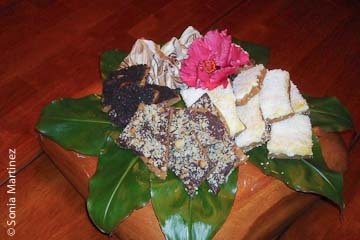 The toffee samples from Lavalicious Buttery Hawaiian Toffee are as good and sinful as the name sounds! Theresa Brulc has been making and selling her island style flavored toffee at the market for three years. This Volcano Village resident started her business trying "to put food on the table for my children". They rarely purchased store-bought treats because of all of the additives and sweeteners in them so she decided to make her own. Theresa used only the purest of ingredients and started selling her toffees to friends and neighbors. They were an instant hit! "Everyone who tries them enjoys the many flavors such as macadamia nuts, grown on this side of the Island", she says. "I use only locally grown fruit, such as the raw organic coconut, local coffee and liliko'i, which is my best selling flavor." Theresa thinks the Volcano Market is an amazing place to begin a business. It has a comfortable ohana atmosphere. Although it is an early market, over by 10:00 am, it's fun and fast! The largest display with the most variety is that of Ellis and Sokha Hester of Hester Farms. The Hester's Farm, a 200 acre piece of land covered in lava with some 30 or so acres of fertile pockets of soil here and there is located at an elevation of 1,500 feet above the Pahala area. The Hesters have been farming for 9 years with part time help, depending on what is being planted or harvested. The farm produces a huge variety of crops. At any one time they might be harvesting 30 or 35 different veggies. On the day I visited their display included an assortment of zucchini, yellow crooked neck, pattipan and other squash; broccoli, cabbage, cauliflower and Romanesco; globe onions, beets, chard, spinach, arugula and bags of mixed salad greens; an assortment of different colored bell peppers, cucumbers, tomatoes, potatoes, beans and pineapples among others. Ellis Hester explained that although the farm is not certified organic, only macadamia nut husks and other natural waste is used for composting and they do not spray chemicals of any kind. The farm is off grid and solar powered. The Volcano Farmers Market is a one-of-a-kind on Hawai'i Island for its senseof celebration, diverse local products, and strong community spirit. Although it's a good drive from our island's population centers, it's well worth getting up early and making the quiet, Sunday morning, traffic-free the trip. Location: 19-4030 Wright Rd., Volcano. On Wright Road, straight across Old Volcano Rd. Cooper Center comes up on the right. Type of Market: Farmer's, bakers, crafters. Prefer no 3rd party resellers. How Funded: Cooper Center is a County facility, run under a memorandum of understanding with the County. We are responsible for some of our expenses, and the Farmer's Market helps pay those bills. Any repairs and maintenance is funded by Cooper Center. Cost per stall/booth: At the Cooper Center end it's $15.00 for one table, $25.00 for 2. In the covered court vendors must bring their own tables at $10.00 per. Growth since started: Vendors have more than doubled in all areas. a. Number of vendors: 26 vendors about 5 informational tables at the Cooper Center end, in the covered court it is about 15-20.
b. Increase in income: doubled. Geographical range of vendors: Kurtistown to Na'alehu, some come as far as Hamakua. a. Range of products: Veggies, fruits, herbs, dairy, poultry/eggs, meat, seafood only on occasion, processed/value-added. 1 beef vendor direct from Ranch to market. b. Best selling products: Lettuces, any veggies from Hester, coffee packaged and fresh served probably grosses the most. Other special features: Tried music once, nobody wanted. We set up coffee tables and many people stay and visit eating the fresh pastries and drinking coffee. Also popular is the hot Thai soup.